Mid-century Japanese salt and pepper shakers. oh I love these. 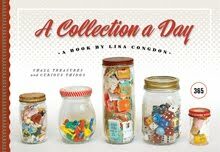 incredible collections daily! fantastic! absolutely love the colors! These are great Fiesta colors! The color, the shape, everything about them are beautiful and happy! cool! I've been on the look out for some shakers and these are awesome! where did you find them? the teardrops are stunning. love this blog you've been keeping, lisa! so awesome. love how bright they are!